1 of 6 Heat oven to 325 degrees F. Coat the bottoms of two 9-inch round cake pans with nonstick cooking spray. Line with parchment or waxed paper; coat paper. In a large bowl, whisk flour, sugar, baking powder and salt. In second bowl, whisk oil, egg yolks, 1/2 cup cold water, vanilla and lemon juice. Let sit 3 minutes to thicken, then stir slightly thickened oil mixture into flour mixture until blended. Set aside. 2 of 6 In large, clean bowl, beat egg whites and cream of tartar on medium speed, until foamy. Increase speed to high; beat until stiff peaks form, about 3 minutes. Fold one-third of the whites into flour mixture; then fold in remaining whites. 3 of 6 Divide batter between prepared pans, gently smoothing tops. 4 of 6 Bake cakes at 325 degrees F for 30 minutes or until cakes spring back when lightly pressed. Run a thin knife around edge of pans to release cakes. Invert cakes onto racks; tap to release from pans. Remove paper; return to right-side up. Let cakes cool completely. 5 of 6 Slice one of the cake layers in half. Repeat with second layer, for a total of 4 layers. 6 of 6 Slice 6 cups of the berries and toss in a small bowl with 2 tablespoons of the melted jelly. Place one cake layer on pedestal. Top with 1-1/4 cups Filling (recipe follows). 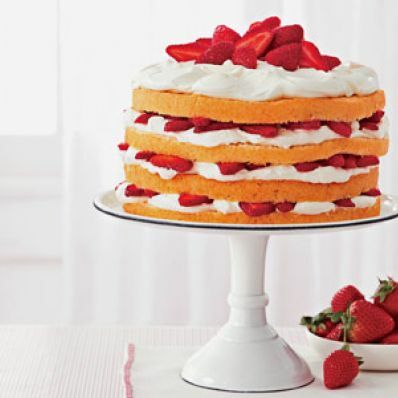 Layer with 3/4 cup of the sliced berries. Repeat twice more, then top with final cake layer. Cut remaining berries in half. Toss with remaining 2 tablespoons jelly. Spread remaining Filling on top of cake. Top with strawberries and serve. 1 of 2 Once cakes have cooled, combine gelatin and 2 tablespoons cool water in a bowl. Let stand 3 minutes. Microwave on HIGH for 15 seconds or until melted. Stir until smooth and then cool slightly. 2 of 2 Combine cream cheese and sugar in a large bowl. Beat with electric mixer on medium speed until smooth. Add cream; continue to beat until very foamy. While beating, add gelatin in a thin stream. Continue beating until stiff peaks form. Use immediately to fill layers of cake; do not prepare ahead of time.